I seem to have 3 healthy children again 🙂 Well, that is not entirely true because Ben has a cough, but still, one with a slight cough is a huge improvement from the last 2 weeks! As if making up for the time spent in rest and recuperation recently, today has been non-stop! From the minute the kids woke up they have been busy. We have done numbers, adding, place value, colour mixing, painting, messy play, Reading Eggs, reading books, drawing, writing and more. This morning the kids were very excited to see that I had (finally) made a start on our Spring/Easter display. 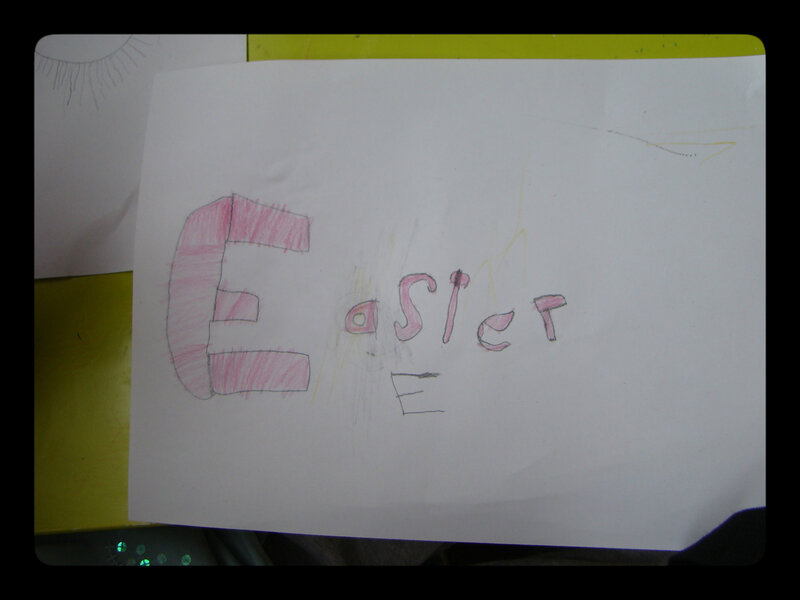 I put the Easter Egg pictures up that they did yesterday with a couple of posters I printed from Activity Village. Jasmine immediately went to work drawing more pictures for the display! I was actually amazed when I saw her first piece of work; I think she must have got the idea from the posters but she has never done anything like this before so I was very proud! 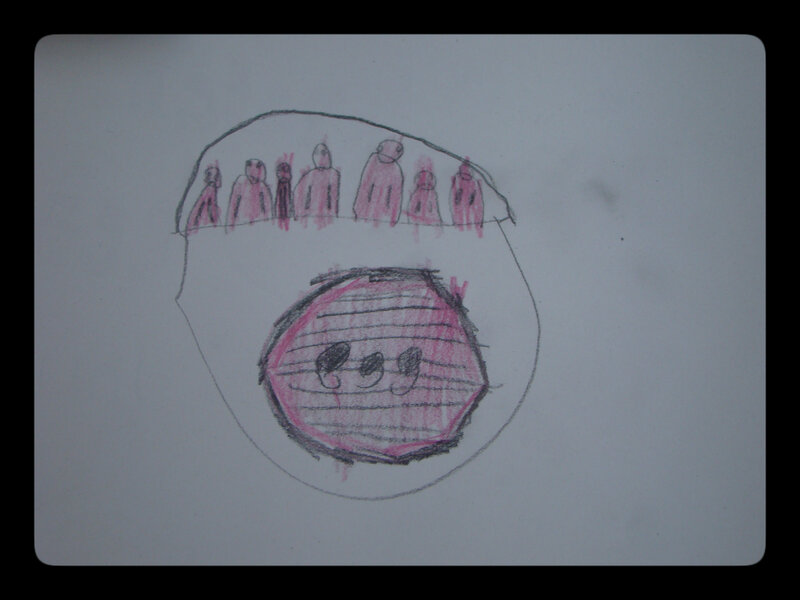 She also drew an Easter Basket compete with chicks inside and an egg on the front for me to stick up as well! This picture was taken before she finished colouring it in, but I was worried that if I left it too long to take a photo she would have coloured in the writing! While Jasmine was busy with this, Thomas had the calculator and was doing some addition. As is the way, he was trying to add large numbers! He came to me at one point and showed me the number 11,011 and told me it was the answer to 101 plus 110. Hmmmm. I asked him to show me what he had typed into the calculator. He knows one hundred is written 100, so using the mind of a 5 year old, he had typed one hundred and one as 100 and then a 1 at the end (100 1), and the same for one hundred and ten (100 10), so the sum he had actually done was 1001 + 10010! Time for a place value discussion! I did a quick Google search because I was certain I had seen a lesson on Conquermaths about place value but couldn’t find it. My Google search came up with this, which the kids loved! And this, which they also loved! We played the penguin game until I was pretty confident Thomas knew what he was doing, then I got our chunky number jigsaw pieces out and we spent a long time making 3 digit numbers and identifying the hundreds, tens and units. Other maths we did today was about adding to a single “unit” to a “tens” number. I can’t remember how it started but we were eating dinner at the time! I explained that it was really easy to work out a sum like this because the answer is in the question (if you see what I mean! – I explained it better to the kids!). We spent most of dinner with me asking them questions like 20+5, 30+8, 60+4, 80+9 and they would shout then answer back to me! They loved it!!! They found it very funny to work out a 10+ sum because I used the word “tenty” as a way of explaining the answer to the first one (eg. 10+5 would be tenty five) and then discussing what “tenty-five” is actually called! They especially loved that!!! Other than maths, we spent a large portion of the morning with paint. I have been wanting to get the paint out for days because I want to make some hand print flowers for our display, so we finally got round to it today. We had sponges, paint brushes and a potato for them to use and they created some wonderful masterpieces! I also got the handprints I wanted! The painting led to lots of discussion about mixing colours. I had red, yellow and orange out today so I think tomorrow I will get some blue out as well and let them discover more. We have also done Reading Eggs today. Both Jasmine and Thomas are doing really well on there. Thomas is now at the stage where he will pick up a book and have a very good go at reading it. It is lovely to hear him read and makes me really proud! Today he read 3 books to me and was very pleased with himself! I do have video of him reading one of the books but can’t get it to upload to Youtube at the moment. I obviously need my techie help (husband!) to work that one out for me! One thing I have realised as today has gone on, is how much of the kids learning is “practical” learning. They “do” a lot of what they learn, rather than write it down or record it. The place value learning they did today is a perfect example of this. Instead of using pencil and paper, we used a video clip, a game and some wooden numbers! It was all learnt with talking and doing. But then I guess this is what my blog is for; to record all the learning that we “do” every day but I am sure I would otherwise forget!